this is an interesting case in which pineville, la. businessman james bowlin is suing russell taylor, the city of pineville, the pineville chief of police and possibly others, for defamation and invasion of privacy. from what we can gather, it seems that mr. bowlin is dating mr. taylor's ex-wife and for whatever reason, mr. taylor doesnt appreciate that one bit. so, mr. bowlin alleges, mr. taylor had someone as yet unknown (john doe) but presumably a friend of [taylor] on the pineville, la. police department inappropriately access a police database and passed the information contained there about mr. bowlin back to mr. taylor. mr. bowlin claims that mr. taylor gave the information to some of his customers who stopped doing business with him. additionally, some anonymous person postal mailed mr. bowlin a copy of the information gleaned from the police database. 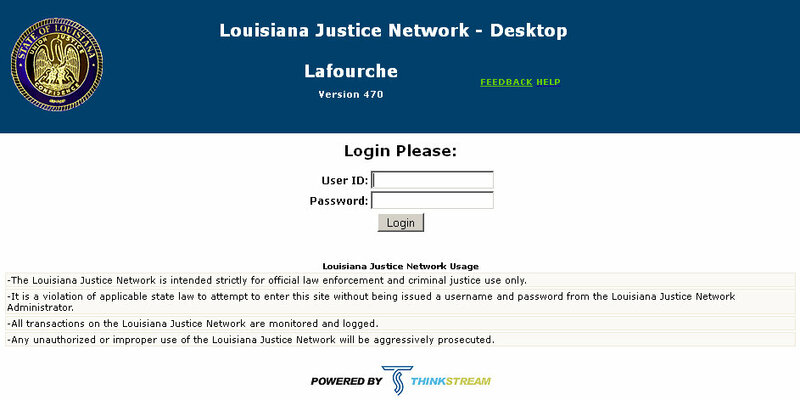 the louisiana state police because they are the agency responsible for maintaining the database have the information that can show who logged in and ran the database search on mr. bowlin. 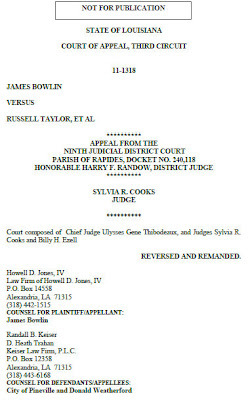 ninth judicial district court judge, harry f. randow it seems was attempting on behalf of the city of pineville to suppress and coverup the revelation of who on the pineville police force improperly accessed the police database as seen by his granting what turned out to be a bogus summary judgement dismissing mr. bowlin's claims as well as quashing the subpoenas he issued to the lsp. but we wonder how judge randow would like it, if someone with access to a confidential police database printed out his file and mailed and passed it around because they were angry with some ruling he made in their case. the third circuit court of appeal obviously wasnt amused with this type of behavior as they reversed judge randow's ruling and remanded the case for further proceedings. James Bowlin (Bowlin) sued Russell Taylor (Taylor), the City of Pineville (Pineville), Terrell Paul and/or Donald Weatherford in their capacity as Chief of Police of the Pineville City Police Department (Chief), and Officer "John Doe." 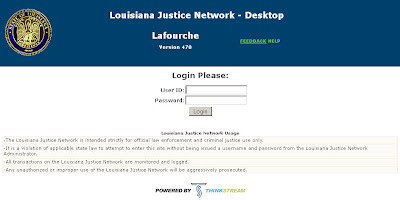 Bowlin alleges Taylor defamed his good name and business reputation by publishing information about Bowlin allegedly improperly obtained from the Louisiana Justice Network's (Network) confidential database. Bowlin maintains the information included his entire police record of arrests, charges, and convictions as well as personal information such as his social security number, date of birth, contact information, and driver‟s license number. He alleges that only some of the information wrongfully obtained is also public record. Bowlin is a small business owner in the Pineville area. He alleges that Taylor has defamed his good name and business reputation and has invaded his right to privacy. Bowlin and Taylor have a history of ill will which began when Bowlin started dating Taylor‟s ex-wife. Bowlin alleges the confidential information was obtained for, and provided to Taylor, by an unidentified member of the Pineville City Police Department using police computers to access the Network‟s database. Bowlin alleges he learned that an as-yet unidentified member of the Pineville City Police Department logged onto the secure website, obtained confidential information about Bowlin, and provided that information to Taylor. Bowlin identifies his source of information at the Network as Detective Shelly Scott (Scott), an employee of the Louisiana State Police. Bowlin alleges Scott informed him that she conducted an internal investigation into the inappropriate utilization of the database by an employee of the Pineville City Police Department who obtained the database information about Bowlin. Bowlin asserts that Scott cannot provide any information on the matter until she is properly subpoenaed in a lawsuit. Taylor maintains that the information mysteriously appeared in his mailbox one day from an unknown source. manfred mann's earth band "blinded by the light"